1988 – The Copycat Cookbook was written, illustrated and published by Gloria Pitzer (Secret Recipes, St. Clair, MI). 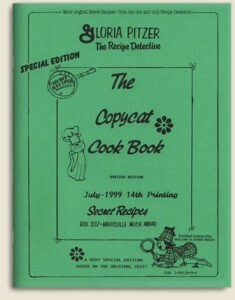 NO LONGER IN PRINT – this cookbook originally had a 120-page, 5.5″ x 8.5″ format with about 484 make-alike recipes of famous favorites not contained within her other cookbooks. 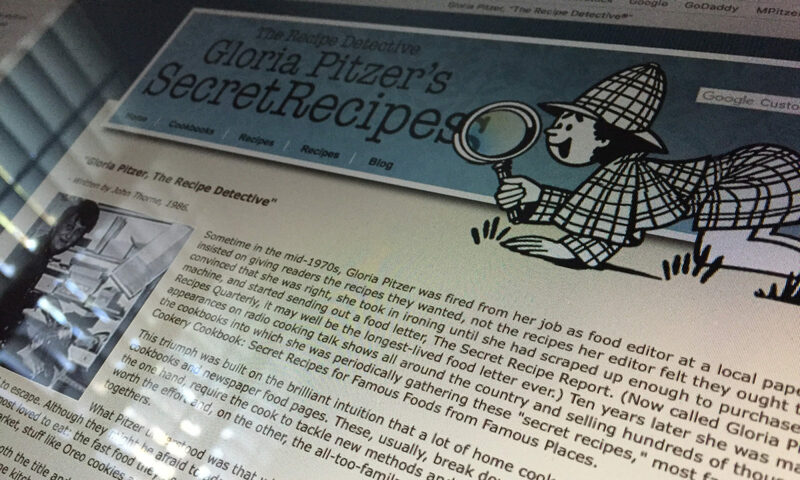 This unique collection includes a little of this and a little of that, imitating menu specialties from Greenfield’s, JL Hudson’s, Chasen’s, Lafayette’s, Frankenmuth, Cincinnati, Mrs. Field’s, Maid Rite, Cinnabon’s and many more! Some of the name-brand recipes are for products such as salads and dressings, pizza, pasta, BBQ, chili, hamburgers, powdered mixes, pies, pastries, sourdough, chicken, shrimp and fish dishes – to name a few! 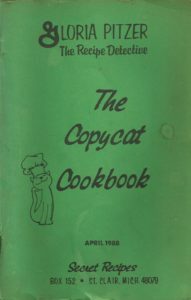 Over the many years and various printings, the original title remained the same, but the cover changed slightly (shown in the pictures above), as did the size and price of the book. 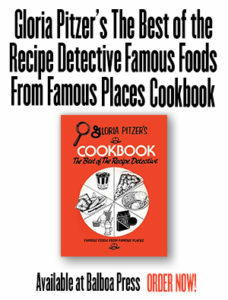 The size changed from the original 5.5″ x 8.5″ format to a 60-page, 8.5″ x 11″ format with over 350 recipes listed. It originally sold for $6 but went up over the years to as much as $9.75 per copy until it sold out sometime between December 2000 & 2001.